At the height of Android tablet fever, right before people got their hands on the iPad 2, Motorola’s Xoom was considered the device that would give Apple a run for their money. Once the price points were introduced (they were the same as the original iPad i.e. cheaper than the Xoom) and the thickness and weight specs were unveiled (making the Xoom look like a last-call at the pub hookup), a lot of the enthusiasm was sapped from the Motorola camp. But the Xoom still had that sweet 1280 x 800 display and awesome Tegra2 dual core processor, so there was still optimism that the raw performance of the device would at least be able to hang with the iPad. Well, they were half right. The Xoom is indeed faster than the iPad in most of the graphics tests run by the good folks over at Anandtech. But unfortunately the new A5 chip used by Apple in the iPad 2 absolutely buries it. Like turning-away-a-little-embarrassed-because-I-feel-badly “buries”. Full coverage of the carnage here. As many of you know, there’s little love lost between TMA and the community of tech rag bloggers. Take Preston Gralla. The man gets nothing right, but persists in his word count. To look at it more generously, Preston does bring a contrarian viewpoint and some writing credits for books about Windows XP and Android to the table, whereas TMA might be considered a sellout in that he has critical reviews, sales figures, company performance and the market on his side. At the risk of having you stop reading now, for those of you who don’t know, Gralla writes for Computerworld, which is the technology equivalent of cage-liner. A day prior to what will likely be Apple’s announcement of the iPad2, Gralla managed to get his latest shot across the bow of logic and overwhelming contrary opinion, “Eight reasons the Motorola XOOM beats the iPad” published just before Apple snuffs any legitimate point the author was hoping to make (read: approximately none). His XOOM rhetoric does remind me of the lofty stuff he showed us in his now-legendary “Five reasons why Vista beats Mac OS X”, which unfortunately couldn’t rescue that turd either. Just because Gralla’s endorsement doesn’t bode well for a product’s future doesn’t mean we can’t have fun with Preston. Let’s dissect this masterpiece. You can tell out of the gate that this is a Computerworld review of a product pitted against an Apple offering from its masturbatory frothing of the device’s requisite components. It culminates with “It’s also capable of playing 3D games”, which is hilarious in that none exist for the XOOM and that approximately 20,000 do for the iPad. “The Xoom’s 10-inch screen has a resolution of 1280 x 800, and is widescreen, so it’s great for watching movies and videos” and also how the device demands to be held. Try stretching your thumbs across the onscreen keyboard and typing on it. “With the Xoom, you get front and rear cameras, for taking photos and videos, and for video chat. With the iPad, you get no camera. Two trumps none.” For those times you want to hold your lunch tray in front of your face and shout “Cheese” or “Look natural!”. Also a “feature” whose advantage disappears in about 24 hours. “The Chrome browser built into Xoom is far superior to the iPad’s Safari. It does tabbed browsing, and like the PC and Mac versions of Chrome, a single box does double-duty as a search box and for typing in a URL. And it will also automatically sync your bookmarks with Chrome on your PC and Mac.” Tabs. A box to type search into. Sync. I have all of those now, though. Must be that cohesive development environment I keep hearing about that generates scores of alternative WebKit browsers. It must not be a very coordinated hand because 60,000 apps managed to slip through it. Contrast this draconian mitt to the barely-perceptible hand of Google lifting your personal information as fuel for its entire revenue model. Information it’s also offering publishers as a magnet for their “One Pass” paywall. It’s hilarious how even a hit-piece like this tripe can be so oblivious to its own stench. “Google’s built-in apps, including Gmail, Google Maps, and Google Calendar, beat anything built into the iPad.” Totally objective. One thing that is correct about that list: it represents just about every app available for Honeycomb in total. Google better hope they’re good. Aside from being everything wrong with tech journalism online, I have to admire Preston Gralla’s willingness to step into the face of sanity for the sake of some fanboy rageclicks. If people like Gralla didn’t sacrifice any possible integrity from readers looking to them as a source of information, TMA wouldn’t have so much to write about. Update: Now that the iPad2 announcement has come and gone, I thought it’d be fun to see how Apple’s new offering stood up to Gralla’s scathing take-down of the original iPad. Good thing Preston got that article out of his “draft” folder before today. Man, would he have looked silly. 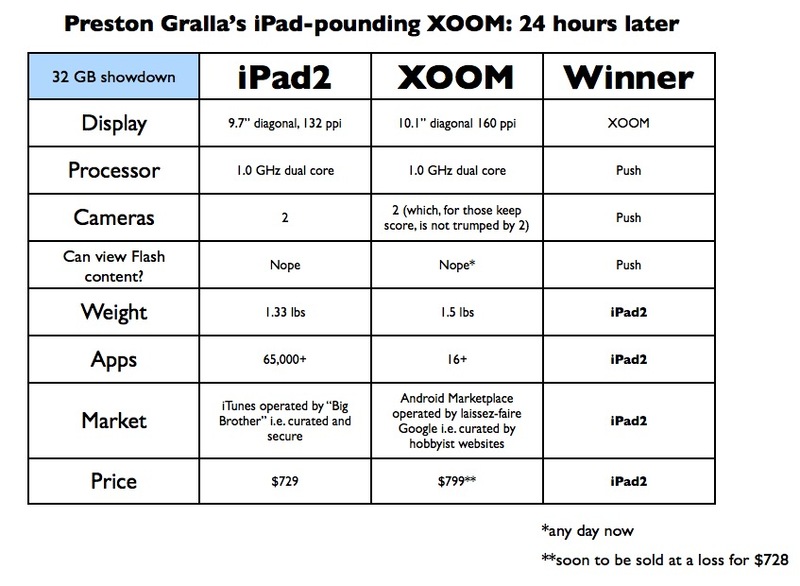 Update 2: I actually saw this referenced earlier this afternoon on Daring Fireball, but I thought Gruber was behind on Gralla’s antics and not that he was actually restating his position regarding the XOOM’s superiority after the iPad2’s introduction. TMA’s policy of no linkage for hit-whores still stands, but in summary: he’s blown right past heavily-biased Hitwhoria to full-on batshit Thurrott’s Syndrome. I would recommend Googling it for the comments, though.